A successful website hinges on so much more than merely aesthetics. Careful analysis of consumer wants and needs coupled with strategic execution is critical to the delivery of a successful product. 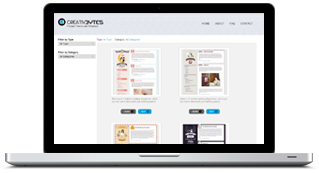 At Creative Bytes, our methodology marries targeted marketing goals with the best that design has to offer. Making sure users enjoy our websites and are able to use them without confusion is what make us happy. © 2009 - 2019 Creative Bytes • All Rights Reserved.